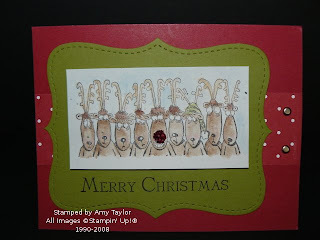 This is one of the cards we'll be making on November 1st for my Christmas Stamp-a-Stack class. It uses the Holiday Line-Up stamp set and the Top-Note Bigz Die for the Big Shot Die-Cutting Machine. Rudolph's nose is made to shine using some chunky glitter.